While this brief spurt of creative inspiration might seem odd, devotion to this spice mix is very great in some parts of the country. My brother was even planning to pick up some of it to bring it back to London so that he’s not left empty-handed in case he or his wife gets a craving for a taste of home. 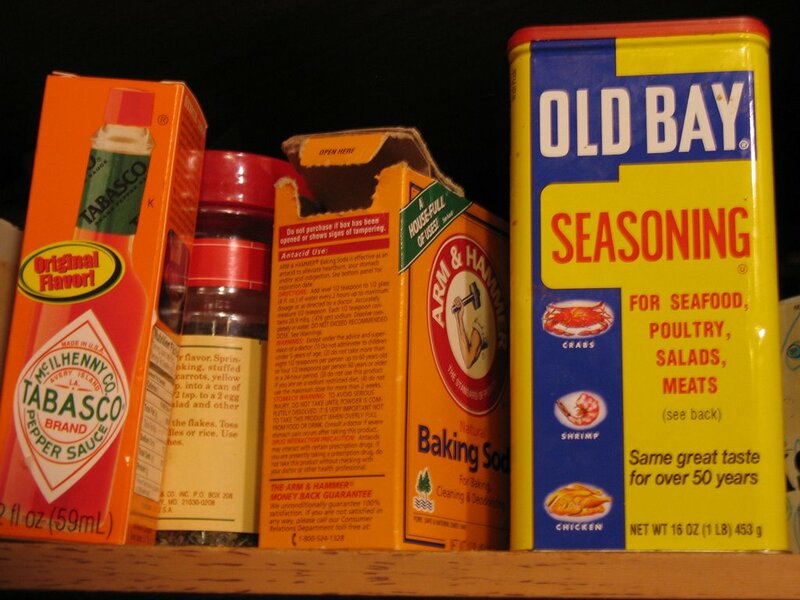 Growing up in a mid-Atlantic seaboard state, it was a staple found in everyone’s cupboard, or so it seemed. It was just natural to find it there (but then, so did was seeing a can for bacon drippings stored in the fridge, as well). Surprisingly, I don’t have any in my New York kitchen. Up here, I don’t think I would ever find a use for it, but then, I might be too crab-specific about its flavor and point of reference. I’m a bit of snob about crab and skeptical anytime I see “Maryland Crab Cakes” on a menu. I want to meet the crab. I want to hear it say “Bal-mer.” If not, it’s poseur crab to me. It will be shunned. 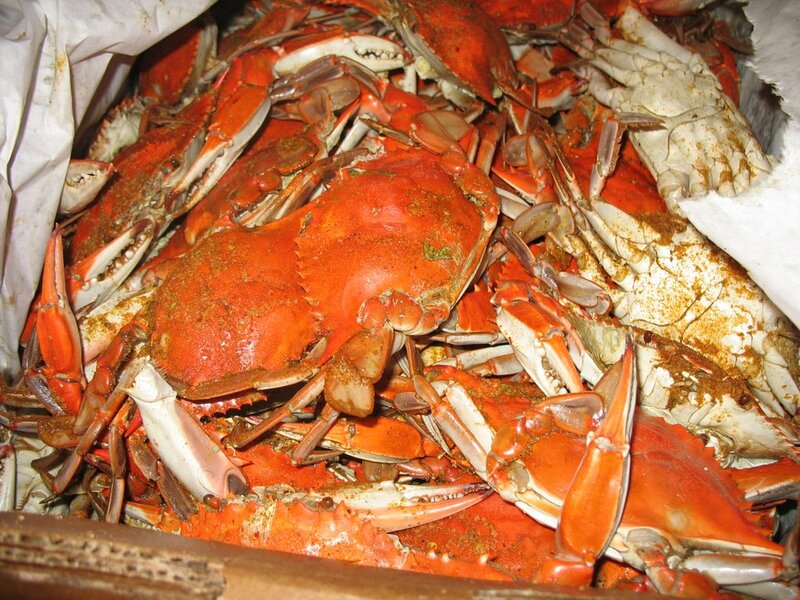 One of Old Bay®’s chief uses, naturally, given the title is with Chesapeake Bay crabs – sprinkled on top during the cooking process and served on the side when eating the steamed goodies. Despite the over-fishing of the species (some of which I personally blame on the new, wide-spread popularity of soft-shell crabs, but that, for the record, is a personal bias) and the consequent higher prices for those that are being caught, my family has managed to keep up its annual tradition of reunion/crab feast during the summer months. 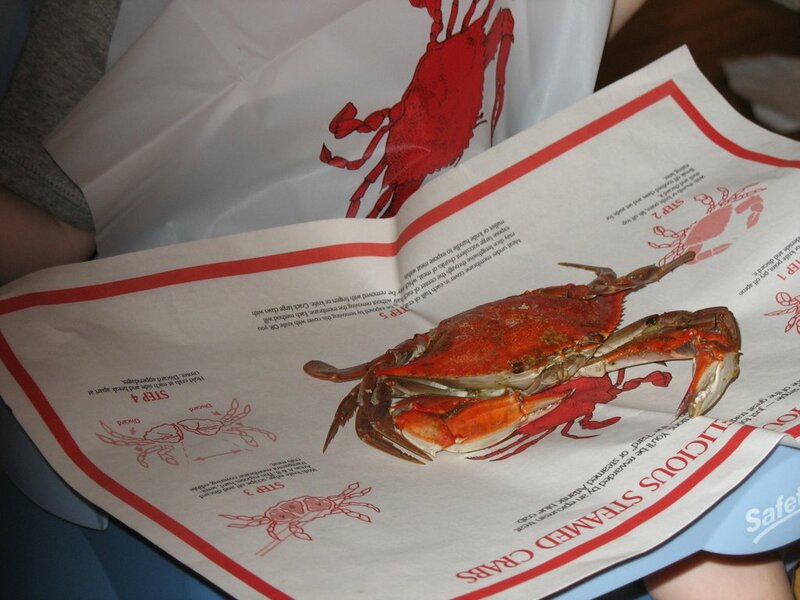 Between Memorial Day and Labor Day, my mother’s rule for the “official” season, whenever a majority of the clan can get together, we children put in a bid for crabs. The best thing about this gathering is that it also serves as a catch-up feast and general open house where other relatives and friends drop by for a chat and a laugh, and of course for the crabs. This year, my parents decided not to go to the wharf in Southeast Washington, D.C., as the specimens found there have been quite small of late (and I bet some haven’t even been the legal size to be sold). They went to a local seafood place where they can also get them cooked to order. Although this takes the fun out of it for those who like to pick the crab that they will personally eat, judging which one is the feistiest of the lot, it also means that no one has to clean up the crab pot as well. For us, this event has always been a way to say “welcome to the family.” One in-law who passed the test with more than flying colors early in the dating game is my sister-in-law. She is a champion crab-cleaner. She is a pro. She is a machine. Her endurance at the table (with so many people in our family, we have to rotate seats to accommodate everyone) is legendary. This year’s feast was also a bit special as it was my newest niece’s first one. Baby loved her first bite of crab. Next year, I think we may have to find another place at the dining room table. We may just have a new sheriff in town. 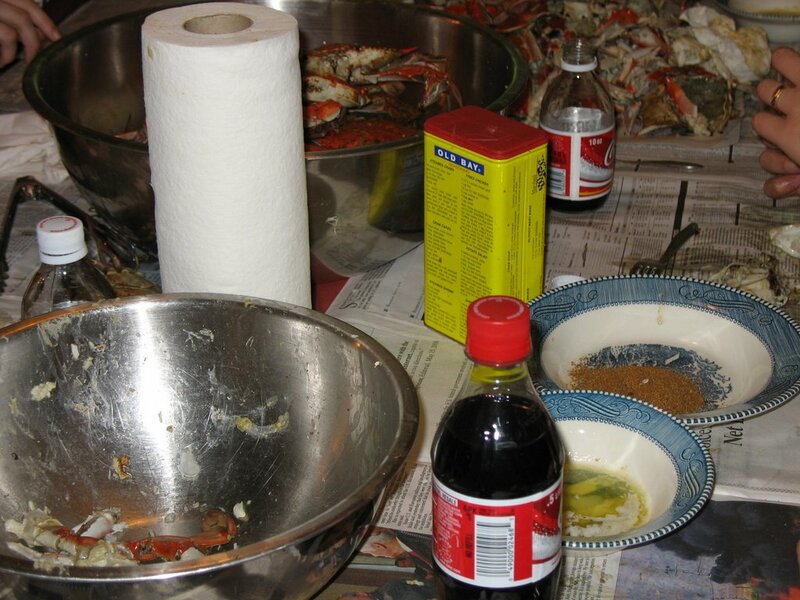 But wait… what about the crab eating debates – hammer versus nutcracker and fork, or butter versus cocktail sauce? the best part was, after we did this i got to go to the beach with my fam and do it all again!! so smart of me to marry into another crab-loving family!! Sarah, you know that Jax is an instant gratification, purist crab eater. I also didn’t cover the eat-as-you-go vs. stockpiling question, either. I wanted to keep this a nice, cordial, family-oriented post so I was saving the “meatier” issues for next year when we decide the all-important question: Do nieces get their own crabs or is their allocation part of that of their parents’ a la Almond Butter Sticks? Discuss.